Glad to hear you had another very successful party! Thanks for the invite - - perhaps next year I can work the travel schedule to attend. BTW, what was the runner-up to Goose Creek? Cute photo of Duane and me, Hilde. That's exactly what I was doing - me in scientific pondering mode. I had to go back a few times to narrow down my choices for a few categories. Zana, Hilde and I talked about getting together before the holidays to do a Norwegian baking class. We could add Italian and Armenian to that - wouldn't that be fun? Duane, Zabby, and I did very well on Sunday. I'd wanted to go to Mass at St. Steven's, but that was the only thing that didn't fit into our plans. We got Zabby onto the train with time to spare in spite of Front Street still being barracaded for Buskerfest. We also hit City Hall to pay our respects to Jack Layton in the book of condolences. That was very emotional. I'm very relieved that Irene spared New York. That would have hit the entire country very hard, not just the New Yorkers themselves. I pray for those in New Jersey, New England, and the Carolinas who lost loved ones and property. My beans grew while I was gone and so did the cucumbers. They just won't quit! I'm grateful for the harvests, but I'll be very busy this week managing the canning. Mario Le Mew (our aging 17 year old cat) is doing fine. He's still at the vet, but we pick him up at 3pm. It's great to travel, but we miss our furry kids so much when we're away. Remy, I found a kitchen mat/rug thing at Target. It has been on my "wish list" for quite some time - to take the pressure off hours of standing while canning. I mention it because it has tomatoes on it and says "Fresh Tomatoes" like one of those antique wooden boxes we talked about yesterday. It's also over-sized, so I'll be much more comfortable from here on out, I think. We hit Wegman's and bought them out of dairy as usual. Russ and Nicky, you really ought to consider that - prices are more than 50% cheaper for things like milk, butter, and cheese. I told Zabby that I use my Wegman's loyalty card more than my Shoppers Drug Mart Optimum card! Thanks so much to everyone for their wonderful conversation. Pomona, I'd volunteer to watch your daughter at a moment's notice if you were closer! She's precious! Votes were all over the place this year. There were some for Stump of the World, Humph, Eva Purple Ball, etc. oh and someone even voted for Red Pear?! That cooking class is a great idea. Hilde has a perfect kitchen for doing that stuff too. I'm glad you found a good mat at Target! I'll have to go check it out. Also good that you got stocked up at Wegmans. I've got a ton of beans out there too. I need to get out there and get picking. Oh, don't forget to check if I already gave you the Jembo Polish beans or not. If you need tasters for your baking class I am available!!! Nice photos! That Orange Minsk tomato caught my eye. I might have to add that to my "to grow list". I'm sure Hilde will let you know when she plans to hold the cooking class. I'm very happy with it! It has been productive and tastes good too. Nice photos Nicky, and it was nice to meet you at the party! I think it might be too much to do both Armenian and Norwegian the same day, Julianna, as the things we were going to make takes some time. Zana has suggested doing a few other Armenian dishes as well and that sounds like a lot of fun. How about we have two cooking classes? One Armenian and one Norwegian? Like Remy said, my kitchen is perfect for that kind of thing and getting together to cook should be a lot of fun!
. If we start Friday night, we could do the grocery shop for most items then, and bring the rest with us too? So who we talking for the class - Hilde, Remy, Julianna, Nicky and moi? Anybody else? And Hilde, its only wheat gluten I have the intolerance to...and I've been known to make a choice whether to "pay" for eating something or not...like taste testing the baklava. But I'll try to get my hands on some of the gluten free phyllo that is supposed to be made in TO. I've only heard about it, but am willing to try it ahead of time to see how well it works. So don't worry on my behalf about the gluten issues for any of your dishes. Great brainstorming on the cooking class(es) thing. Hilde has a good point about how long these "Old World" things can take. I can vouch for that in Italian baking for sure. Zana, you also have a valid point of maybe stretching the classes into a 2-day thing but 1 weekend. I like that idea also. Friday night probably won't work for me in terms of the actual baking, but certainly shopping for items for Saturday would work fine. I'm definitely a morning person and I turn into a pumpkin in the evening - my brain actually clocks out. Baking on Saturday and Sunday sounds like it might work from my end. Nicky, it would be so fun to have you come as well, but being away from your kids that long - that can be hard if they're little. Let me know what you all think of this input. Today, oh so surprisingly, I'm sure, for those of you who know me - I'm prepping vegetables for canning this weekend and packaging seeds. PS Mario's just fine. In fact, he's better than he has been in some time. I think he was hiding his symptoms from everyone. His kidney values dropped remarkably, so he's got "manageable kidney disease" which could result in a few more years of happy cat life. Glad to hear that Mario is going to be OK! Whenever everyone gets together, I will do my best to be there too. BTW did you go to Pizza Junction? It was featured on the TV show Diners, Drive Ins, and Dives last night, and it made me remember us talking about it at the party. Oh and remember the spring break story? Here's the video for you. It is the blonde guy playing the keyboards. We didn't get to Pizza Junction - that's on the list for next time. We actually went to the 'stone oven pizza' (or something similar) on the main street of the island. It was really good, although I'm not sure where Russ put the food, as I think he had about 10 plates full at the party! Oh and Julianna - I'm happy to hear about Mario too! I will PM all of you and then hopefully we can agree on a time to get together! Julianna, I love the name Mario Le Mew! Very funny! I am happy he is doing better! Glad to hear that Mario is doing well....and love his name too. I replied to all on the pm...with alternate dates...sorry...but Oktoberfest is a set booked time for me annually. Whenever we do this, its going to be a blast! A bit of sad news to share. Mario Le Mew passed away on Monday morning. We knew his time was nearing, but it's still been tough on all of us to lose him. He was very tired and ready to go and I'm at peace knowing we did everything we could to make his last days as comfortable as possible. After we returned from the party, he was doing very well for several weeks. He started declining rapidly in October and that's when we knew he wasn't going to be with us for much longer. He had a really good summer, spent lots of time outside rubbing his face on the catnip, and slowly surveying his backyard territory. I'm so thankful that he had as much freedom as he did in his life. 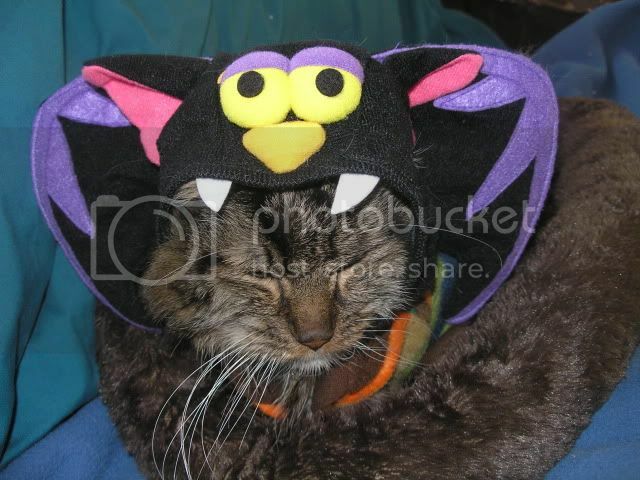 This Halloween photo was taken on one of his last really good days.